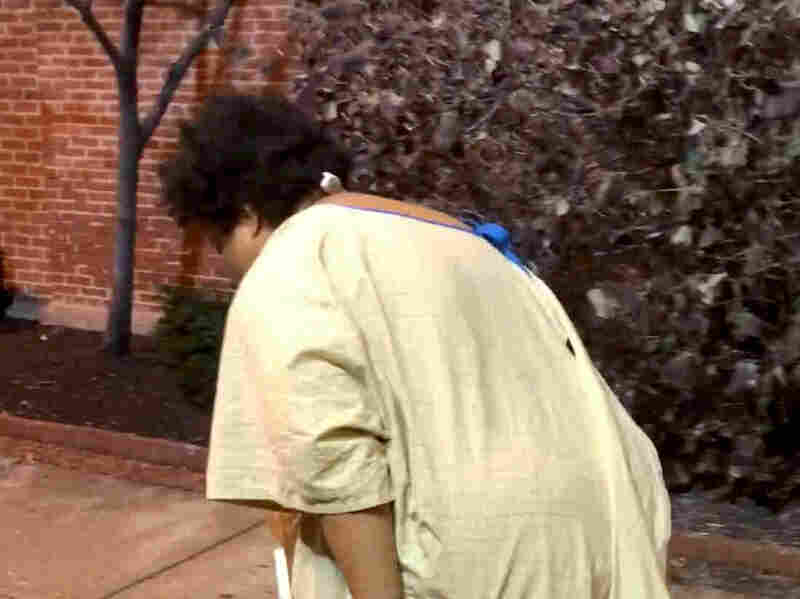 Feds Investigate After Patient In Hospital Gown Was Left At Baltimore Bus Stop : The Two-Way A video showed a confused woman discharged only minimally dressed in cold weather. It prompted an apology from — and an investigation of — the hospital. The family is considering a lawsuit. A federal regulator has launched an investigation into a Baltimore hospital after a passerby shot a video earlier this month of a confused patient wearing just a hospital gown discharged at a bus stop on a cold night. The video provoked outrage across the country, prompting an apology and an investigation by the University of Maryland Medical Center Midtown Campus. Now, a Centers for Medicare and Medicaid Services spokesperson tells NPR that it has authorized a federal investigation into the hospital over potential violations of federal regulatory requirements. CMS says it initiated the investigation because it heard about the incident through media coverage. It's not clear precisely which regulatory requirements are being investigated and what the penalties would be. It's worth noting that CMS is responsible for investigating potential violations of the Emergency Medical Treatment and Labor Act, which requires Medicare-participating hospitals to examine all patients who come into the emergency room. The law also requires care providers to stabilize or provide a transfer to those who are having a medical emergency. Penalties for breaking this law could be a fine of up to $50,000 or, more rarely, termination of Medicare and Medicaid status. "If you get the federal government involved and they're looking into your actions and nonactions, it's a big deal, practically and symbolically," said Frankie Berger, the director of advocacy at the Treatment Advocacy Center, an organization that advocates for medical treatment for people with severe mental illness. Rebecca's lawyer, J. Wyndal Gordon, told reporters that she was in a state of "acute psychosis" and that the family is considering legal action against the hospital. "More investigation needs to be done before we figure out all of the contours of the civil litigation," he says. "But the University of Maryland is in our crosshairs, the doctors who mistreated her are in our crosshairs, the security guards — if they are in any way responsible for the trauma that she suffered — are in our crosshairs." Rebecca's mother, Cheryl Chandler, said she believes Baraka saved Rebecca's life. During the emotional press conference last week, she said that Rebecca is not homeless. "Rebecca has insurance. Rebecca has a family who loves her dearly," says Chandler. She describes desperately trying to find her after seeing her in the video that went viral, eventually discovering that the hospital had sent her to a homeless shelter. "If the University of Maryland Medical Center Midtown had provided Rebecca the slightest modicum of care, then Mr. Baraka wouldn't have had the opportunity to record the most inhumane lack of compassion and empathy for my daughter," said Chandler. Advocates for people with severe mental illness believe this case is indicative of broader structural problems in Maryland's health system. "This is symptomatic of a systemwide failure," says John Snook, the executive director of the Treatment Advocacy Center. "I think this specific case will hopefully catalyze the entire system to recognize that we're just doing the wrong things for those most in need."